Ask a faculty member or IT manager what his or her favorite forms of technology are on campus and you'll get an earful. Ask a lot of people who hold those roles, and you'll get an exhaustive list of best-loved and most-used tools on campus. 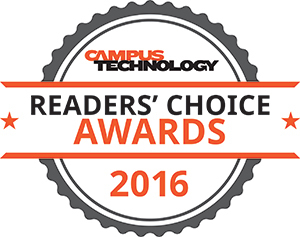 So it is with our second-annual Campus Technology Readers' Choice Awards. We went out to our readership and requested their votes in numerous tech categories, from 3D printers, content management and CRM systems to student success, videoconferencing and wireless access points. In many cases, those companies that won awards last year in many cases didn't necessarily hold their rankings this year. Relative newcomers gained fans quickly, knocking longtime favorites off the podium. Or incumbents proved their continued worthiness by maintaining their leads. The overall results offer a portrait of a changing segment. Because we told respondents to vote only in those categories where they had real favorites, we could tell which technologies attract the most attention these days because they had larger numbers of votes. Higher education is shifting away from commodity IT that keeps the show running behind the scenes, and placing new emphasis on main-stage performances: engaging learners in innovative ways to improve student outcomes and measuring that success. When we asked people to name the most valuable technology for their college or university, a surprising selection bubbled to the top of the list: platinum winner Guidebook. This mobile app builder allows users without technical expertise to create programs that can be published to the Apple App Store or Google Play. As one respondent explained, "We added Guidebook for our orientation programs, and it allowed for us to cut down on printing and provide students and parents information via their phones." Said another, "We are able to provide a great deal of information that can be updated as programs change at a lower cost." Claiming the gold in position number two is Instructure Canvas. This learning management platform is "modern, open," succinctly noted one survey participant. Another reported, "We switched LMSes. The ease of use for faculty and the positive feedback from students made it a valuable decision for this year." Said another, "It is a powerful system to help faculty manage educational resources and class logistics." A tie for silver went to Chalk & Wire and Chromebooks from Google and its partners. "Chalk & Wire has been transformative as a means of supporting our assessment of student learning efforts on campus," declared one respondent. Added another whose institution has used Chalk & Wire for several years, "It is the most valuable for collecting and analyzing data to drive program improvement and student performance." Chromebooks are "easy to use, powerful, inexpensive," explained one reader. Said a second reader, "They provide a level of access that we cannot provide with regular laptops or desktops, given the funds that we have to work with." For the second year running, the top spot was grabbed by Blackboard Learn — a true feat, considering there were easily two dozen contenders in this category. Last year's silver winner, Instructure Canvas, moved into second place this year. And Google Classroom, a new contender publicly released just two years ago, took third place. We asked readers to share their three favorite technologies that they currently use in their capacity as education professionals. We added those up, figured out which ones garnered the largest number of votes and ranked them by count. It's no surprise that every technology or company referenced in this top-10 list shows up as a winner in at least one category — with one exception: Moodle. This open source learning management system has many fans in education, and we'd be remiss if we didn't give it a plug. While Chalk & Wire appeared on the list last year in third place, this year the pairing of learning assessment with e-portfolio was too good to resist, compelling our readers to push it to the top. Blackboard Learn, which integrates digital portfolio features as part of its core LMS, came in second. And Instructure Canvas was the new arrival, taking third. Plenty of education products fit into their own class. To accommodate those reader favorites, we offer the "Other" category. For the second year, Grammarly claimed platinum. This bundle delivers a set of helpful tools intended to help students become better writers. Gold winner Discovery Education Streaming, better known in the K-12 world, has been embraced by higher ed for the worry-free access it provides to top-quality educational video. Learning.com makes another appearance on the winner's board, taking silver once again with its digital content and tools for helping students gain digital literacy. Some products showed up in voting over and over — but without winning in specific categories. These we have classified as the "magnificent seven," by virtue of the affection they've generated among Campus Technology readers. Accutrac, to streamline paperwork and managing routine activities in an automated way. Civitas Learning, for creating a data-based approach for improving student success. Edunav, for providing, as one reader said, "easy access to the full lifecycle of selecting and planning a degree and on-time graduation." Lynda.com, to help staff and students learn how to use the technology that permeates their institutions. Taskstream, for tracking, management, governing and storing assessment at all levels of the school, both academic and non-academic. Turnitin, to help students become better, more honest writers and thinkers. VoiceThread, for helping faculty add increased engagement and interaction in the form of media to their courses. Although many companies offer products for managing student information, just a few names really lead in this category. Ellucian stands above all others — as it did last year — with its three products: Banner Student, Colleague Student and PowerCampus Student. Likewise, second-place competitor Oracle PeopleSoft has also gained a major following, as has third-place winner Blackbaud. While 2015's list served up the same set of winners in the category of CRM, starting with Ellucian at the top, 2016 saw a switch in positioning between Oracle PeopleSoft, which claimed the gold, and Salesforce, which acquired the silver. As you'll notice, the same two companies — Ellucian and Oracle — dominate across the board in those categories that help the college or university run its administrative operations. As was the case with the SIS and the CRM, Ellucian came in first for ERP, followed by Oracle PeopleSoft in second. Campus Management, which also offers a full suite of programs for handling finance, HR, fundraising and other aspects of campus ERP, secured the silver, as it did last year too. While this important category drew several new names, the roster of champions remains the same with a very tight finish: Ellucian in first place, Hobsons Starfish Retention in second place and Campus Labs in third. Each company offers solutions that promise to help the institution stay on top of student progress and keep in touch with all of its community members — students, alumni, parents and other supporters. This new category can really only claim two winners, although there were plenty of contenders. Open source WordPress, which didn't show up in our rankings at all last year, achieved platinum this year with its easy-to-use blogging software created by a community of volunteers and enhanced with literally thousands of plugins and themes. Drupal, another well-known name in open source content management, earned gold. Student engagement is the name of the game in classrooms these days, and there are numerous ways to achieve that. Student response systems such as clickers have a respectable history in helping the instructor figure out just how much his or her students are paying attention. i>Clicker led the tally, taking first place with its suite of dedicated devices and apps. This year it was joined on the winner's podium by Kahoot, a very different sort of product, which inspires participation through gaming features. Gold was obtained by Poll Everywhere, which has a home not just in education but also in corporate environments. And Turning Technologies, with its assessment authoring tools and integration with presentation software, took silver. Wow, has the lecture capture category evolved. Google's free Hangouts, the popular group messaging platform, hardly made a dent last year among educators, and this year it was the winner in the lecture capture category with its simple recording capabilities. Second place was taken by another surprise winner, Blackboard, which has long promoted its tight integration with Echo360 for lecture recording and also offers recording functionality in Blackboard Collaborate. (In both cases, it may be that the integration is so transparent, faculty don't know just where Blackboard Learn ends and the other applications begin.) Third place was a near tie between Panopto and Echo360, both pioneers in this category. The current state of document cameras is an excellent example of building a better mousetrap. What was initially a tool produced to share notes or specimens with an entire class has now acquired features that allow for display of content from the instructor's device, recording of presentations for later viewing and providing microscopic images for up-close examination. Last year's platinum winner, Elmo USA, held its first-place standing this year. Newcomer Samsung earned second place. And WolfVision, which offers a ceiling-mounted "3D Visualizer" system alongside a few other more traditional document cameras, took third place in a close race with several other contenders. People had plenty of strong opinions about projectors. Yet one company was the clear victor: Epson. With the company's education-friendly pricing and its wide array of projector types — interactive, 3D, short-throw, large room and ultra-portable — it has found fans on multiple campuses. Taking the gold this year were two familiar names — Panasonic and Sony — which also offer dozens of models for any kind of room type. InFocus retained its silver ranking for the second year in a row. Projection technology is merging and expanding, as indicated by the three winners in this category. Dominating the votes for the second year was Smart Technologies, which long ago grew beyond its interactive whiteboard roots to produce interactive displays, learning software and dry-erase whiteboards whose contents can be saved and shared. A new name on the list this year, Promethean, took gold with its popular collection of interactive whiteboards, walls and tables. Close behind in third place was Epson, which doesn't offer a whiteboard per se; but then again, with its interactive projector technology in place, who needs one? Here's a category that has certainly grown in popularity and choices. The top two winners didn't show up on the list at all last year. In first place was Citrix GoToMeeting, which has gained a home in multiple institutions for bringing together people from around the world. In second place was Zoom Video Communications' Zoom, a fairly recent addition to the segment that grew out of talent that used to be part of Cisco's WebEx division. Microsoft's Skype and Skype for Business won third place. Although this category and the previous one cross functional boundaries — bringing people together to collaborate online — different winners appear on each list, possibly demarcated by the size of the audience. People may not realize that Adobe Connect, platinum winner, has the capacity to accommodate hundreds of participants, even though Campus Technology has profiled just that kind of installation. Google Hangouts, the gold winner, is part of Google Apps for Education; that version, which is free, can accommodate up to 10 participants. (The "work" edition can handle up to 25 people.) The "basic" or free version of Silver winner Zoom, which also took a medal in the previous category, can handle up to 50 participants; paid editions have no limitations. This is a little covered but important category that should be celebrated for helping faculty preserve their throats. As classroom interactivity and collaboration become the norm, it may be that the only way for the instructor to be noticed above the fray is by the amplification of his or her voice. Smart Technologies, which has won first place for two years running, offers a couple of classroom amplification systems that integrate with its interactive whiteboards. Second-place winner Califone, also a winner last year, specializes in the "sounds of education." Third place found a tie between AtlasIED, which covers not just audio but other forms of classroom communications, and TeachLogic, which specializes in microphone systems. Educators who flip their classes or use recorded lectures for other purposes want to produce videos that are accessible to everybody in as many ways as possible (not to mention, that feature is required for institutions that accept federal funding). This year's platinum victor was YouTube, which automatically (and freely) generates subtitles and closed captions for uploaded videos or allows the video producer to add them manually. TechSmith's Camtasia, which took gold, facilitates captioning with speech-to-text and manual text entry. Silver winner Adobe Premiere Pro, part of Creative Cloud, accommodates captioning from third-party applications or enables manual creation. In this category, platinum recipient Microsoft PowerPoint earned more than four times the number of votes of the next most popular presentation software winner. Long a part of Office, this two-year winner is also a part of Office 365 for Education and available as a mobile app. Prezi, champion of gold, offers a free education plan ("Edu Enjoy") that delivers online presentations that can be viewed on any device and enables the author to store up to 4 GB worth of slides. Paid plans stack up the features, such as the ability to do offline work and official Prezi training. Silver recipient Slides, Google's free presentation app, provides templates, collaboration tools and file integration with PowerPoint. This year's ranking duplicated last year's exactly. Microsoft Office and Office 365 took platinum, followed by Google Apps with gold and Adobe Creative Cloud with silver. Microsoft and Google's suites focus on e-mail, word processing, spreadsheets and presentation, with communication and collaboration functions adding an extra layer of usefulness. Adobe's suite offers productivity of a different flavor with its tools and digital assets for visually and aurally creative work. Adobe's online tools and digital assets reigned head and shoulders above all other software makers in this category, giving it platinum placement. However, Apple's movie, music and photo tool collection has its many fans, giving it a solid win for gold. Two of last year's victors for this category were also this year's winners. TechSmith Camtasia took the top spot with its arsenal of tools for screen recording, video effects and editing and sharing capabilities. Adobe came in number two against a wide field of potential nominees, with its many tools for helping instructors create digital content. For the second year in a row, Apple's masterful iPad, with its potential to run 1.5 million apps, zoomed to the top of the list to take platinum. Last year's gold winner, Samsung Galaxy, crushed its competitors as well with a broad mix of Tabs and Views. Chromebooks may not get the kind of attention in higher ed that they do in other segments, such as K–12 — but with quick boot-up, fast access to free productivity tools and lightweight form factors, they fill a real need for users. Google, which offers the Pixel, secured platinum this year, as it did last year. Dell won gold. And Acer took silver. It would make sense that platinum would be earned by the company that understands Windows better than anybody else. And thus Microsoft with its Surface line of tablets topped the list. Dell, which offers two lines of Windows tablets, the Venue and Latitude, won gold. And Samsung took silver with its Galaxy TabPro devices. Convertibles offer the best of both worlds — notebook capabilities with tablet convenience. Dell won platinum with its 2-in-1 Inspiron and Latitude lines. Lenovo's ThinkPad and Yoga devices claimed gold. And HP grabbed silver with its Envy and Spectre offerings. The same roster of winners that swept this category last year did the same this year, albeit with new models across the board. First came Apple with almost four in 10 votes for its MacBook and MacBook Pro machines. Dell won gold with numerous lines of laptops, including the Latitude, Inspiron, XPS and Mobile Workstations. Likewise, silver winner HP made a strong showing with its many configurations of Elite, OMEN and Spectre laptops. To enable users to access the applications and data they need no matter what kind of computing device they're working on or where they're located, institutions have turned to virtual desktops and thin clients for the answers. VMware, a new addition to this year's winner's circle, took platinum with its Horizon solution. Dell Wyse, whose hardware and software components came in third last year, moved into second place this year. Silver winner HP Thin Client, which combines hardware and software, offers multiple routes to virtualization for the user. Cisco is the giant in this category, having won platinum last year and drawing more than three times the number of votes of the next highest winner this year. Gold was claimed by Aruba Networks, part of Hewlett Packard Enterprise. Netgear took silver with its dozens of wireless AP choices. The results of this category may be slightly confusing. HP, which took enough votes to win platinum, hasn't begun shipping its first 3D printer yet. The company expects to deliver its high-end, industrial-grade HP Jet Fusion 3D 4200 Printer in late 2016. Perhaps the votes are an overall commentary on how popular HP's printers are in the 2D world; or maybe the company's 3D scanning software, Sprout, is making big inroads into higher ed. Longtime 3D printer maker MakerBot, a division of Stratasys, won gold. This new category offered more than three dozen choices of products, but two familiar names took the medals: Cisco for platinum and VMware for gold. Both work well in the data center relying on the technologies offered by the respective companies, whether those systems are on premise or in the cloud. Google Mobile Management was the surprise winner in this category, a startling win for a company that only entered the MDM space a year and a half ago. Google Apps for Work administrators can manage Android and Apple iOS mobile devices as well as Microsoft Windows phones, smartphones and tablets that use Exchange ActiveSync. AT&T wins gold for its solution with multiple suites to cover mobile devices, mobile content and application management, with AirWatch-hosted MDM at its core. JAMF took silver for its Apple-specific Casper Suite for managing iPads, Macs and iPhones. A personal firewall has been built into Windows since XP, so it makes sense that Windows Firewall (part of Microsoft Security Essentials) collected platinum for this product category. After all, few things trump free. But when people pay, they choose Symantec's Norton 360 (gold winner) and Kaspersky (silver winner) for their expanded forms of protection. Certain editions of Norton, for instance, include multi-device licenses covering the user's PC, Mac, smartphone and tablet under a single subscription — and throw in cloud storage for online backup. Kaspersky has a big footprint on campus; it not only offers a comprehensive set of security solutions, but the company runs competitions every year to help college students from around the world develop their cybersecurity smarts. Although we've always thought there was a lot of crossover between personal firewall software and antivirus, our readers don't agree. Only one company shows up on this ranking that also made it onto the previous podium. Platinum winner Norton AntiVirus from Symantec provides basic functionality to stop viruses and spyware for safe online activities. Gold winner McAfee, which was recently peeled off of Intel Security to become its own corporate entity, blocks viruses, ransomware and malware and handles other chores, such as "shredding" sensitive digital files. Sophos collected silver for its endpoint protection solutions. Each of these vendors earned votes for its next-generation firewall. Cisco achieved platinum with a quarter of the votes for its FirePOWER line of appliances. Barracuda secured gold for its NextGen series. And Sophos acquired a silver medal for XG, just edging out other competitors. Schools easily have two dozen choices for emergency notification services, and the best are multi-modal, allowing for transmission of messages over multiple mechanisms (such as voice, e-mail, text, digital signage, desktops and social media); provide templates to enable the campus to create messages for specific types of alerts; and integrate other safety features. For example, Campus Alerts, platinum winner, also includes anonymous student reporting and a "SmartButton" digital panic button for quick calls for help. RAVE, which earned gold, offers similar functionality and includes support for the Integrated Public Alert and Warning System Open Platform for Emergency Networks (IPAW-OPEN), which expands coverage to include messages sent out by public warning systems. e2Campus and SchoolMessenger tied for silver. Respondents did not necessarily vote in every category; they were encouraged to focus on the technologies they were most familiar with. The numbers don't add up to 100 due to rounding.